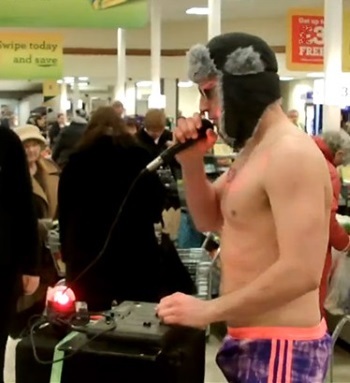 ARE SUPERMARKETS THE NEW RAVES? Teenagers and young adults are crowding the isles of your local supermarket, but they’re not there to hunt for bargains, they’re there to get their groove on. “Supermarkets are experiencing an unexpected surge of popularity among 16 to 24 year olds,” says urbanologist Mike Sutherland. “They’ve become the go-to party place for the young and savvy. Today, teens and young adults are more interested in partying at your local IGA than they are in going to a dance club." Teens say supermarkets owe their current cachet to the ascendance of normcore, a fashion movement that embraces the mundane and the dull. “Supermarkets are monuments to everyday living,” says 18 year old supermarket enthusiast Walter Isaac. “When you’re next to a wall full of breakfast cereal, dancing to the soothing muzak of your local supermarket’s PA system, you enter into communion with the banality of modern life. In some ways, supermarket dance parties are an act of resistance against capitalism. We’re saying, yes, we will consume and commodify, but we will do so while dancing!" Supermarket owners are surprised by the current trend. “Every day, hundreds of people come to IGA to dance,” says supermarket owner Melissa Menard. "So long as they combine shopping with their dancing, we don’t mind at all. We’ve even tried to hire our own DJs once, but our customers told us that wasn’t the point. They didn’t want DJs, they wanted muzak." Walter agrees. “No, we don’t want to dance to EDM, we want to dance to elevator music. The idea is to celebrate the sublime experience of mindless consumption. Muzak is supposed to be ignored, but we’re not ignoring it. We’re putting it front and centre. Normcore is about engaging society in ways that transform boring experiences into exciting ones."